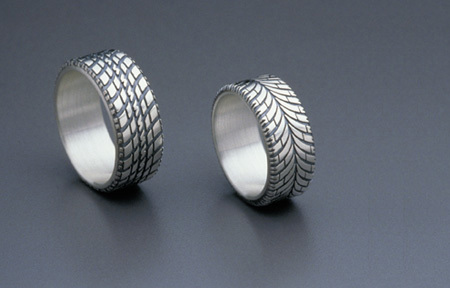 Today’s post showcases five brilliant ring designs which were inspired by tires, tennis balls, bricks, teeth and pistols. Enjoy! Inspired by the beautiful machines all around us, the tire ring marries the appeal of motor sports, innovation and wearable classical jewelry forms. 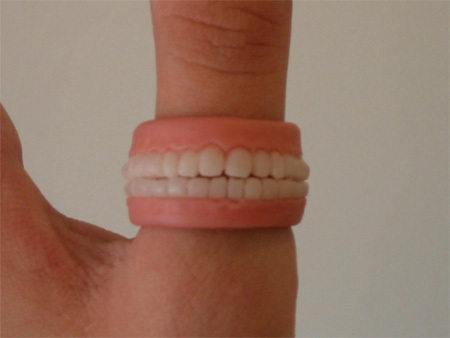 Teeth Ring freaks me out! I’d like to see anyone try wearing that gun ring past security in an airport! Dude, Brian, it’s a joke. I don’t see why you get all irritable when somebody exercises their right to free speech. Next is going to come someone who realizes that it’s a joke, but doesn’t realize the irony in writing 3 paragraphs on why they’re pathetic and have no life in response to a sentence that took 10 times less effort to type. The “Stop saying photoshopped people you losers etc etc” people make me laugh. Don’t feed the trolls, dumbass! 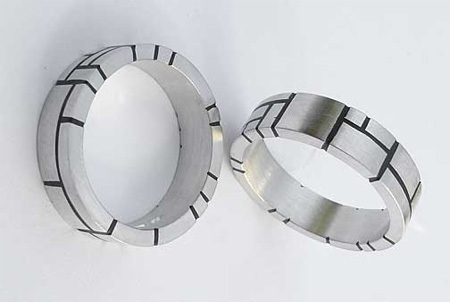 And that tire ring is pretty cool, definitly something I’d consider buying. 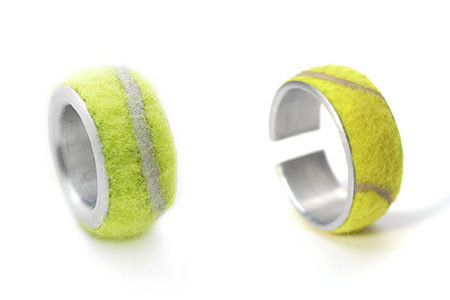 The tennis ball ring seems it would get too dirty being on the finger, and the teeth ring? Now that’s just weird. I’m sorry. Am I missing something? Do you get a prise if you are the first to say “Photoshopped”? I guess I missed it. If these people want to look stupid (although they think they are brilliant for noticing it) I say let them. No skin off My back, I can still enjoy a pic Photoshopped or not. 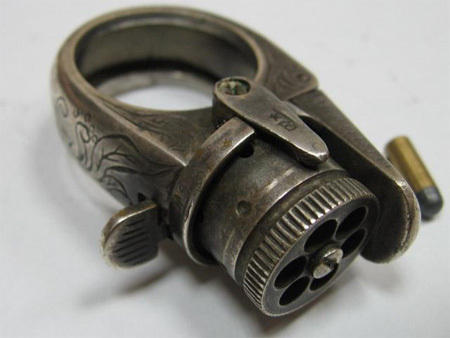 And I LOVE the gun ring, I would buy it in a second! The above comment is Photoshopped for sure! I have seen lots of Photoshops in my time and that is one, the angles are all wrong! Really? I could swear the comment beneath me is Photoshopped. At this moment, the opacity is set to 0%. I want the gun ring. Way too many teeth, that’s not a real mouth. And guns don’t come that small. You can see it’s photoshopped by the pixels. The gun ring is about 100 years old. Hmmmm!! I think I’ll stick to a massive diamond one thanks….something with a bit of sparkle! OMG dude that ring pistol is dabomb! thats a must have! Do you get a prize for spelling prize correctly? The Damiana diamond tension ring is much better. It was co-designed by Brad Pitt. It features an inner and outer ring being held together by diamonds. 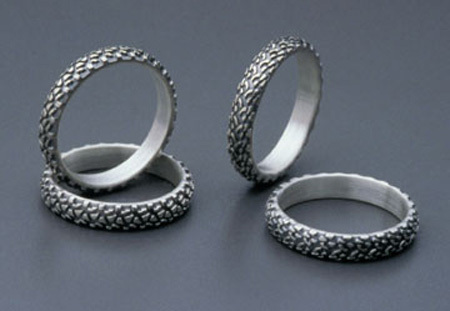 Tentacle rings are waaaay cooler. coolness all around. even if the pixels are wrong! sowhat if it’s chopped? it sais “Ring Designs” on the box also its not impossible to manufacture. ooo these are so interesting and cool, are these only iron or steel ? where can i buy those tire rings?? Ok so…. I’m a jeweler. And I also did an advanced course in image manipulation. So I’ll put it quite simply that these are not fakes. And even if they were, all of these pieces are 100% possible to manufacture. In fact I’m thinking I might make a tire ring myself…. seems a pretty simple task actually. 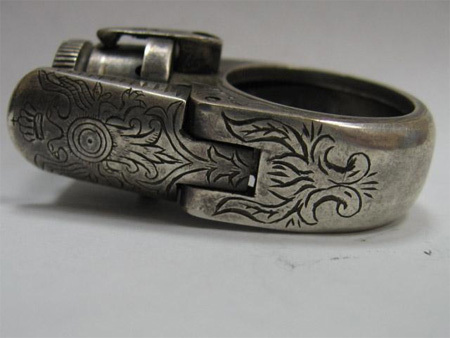 The only thing here that would take quite a bit of effort is the gun ring due to the intricate design of the piece. So to all those “FAKES” callers…. piss off back to 4chan, you aren’t wanted here. i dont care if the pic WAS photoshopped it still looks gangsta. 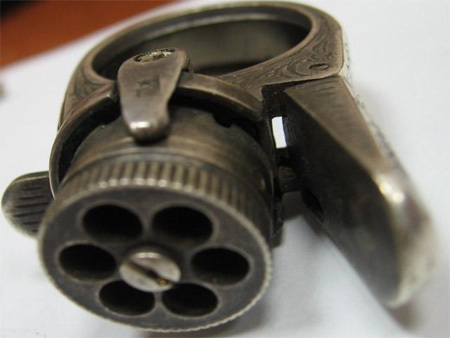 The gun ring looks to hold 6 22cal bullets and could possibly work but might break your finger with the recoil. Not sure I would care to find out.